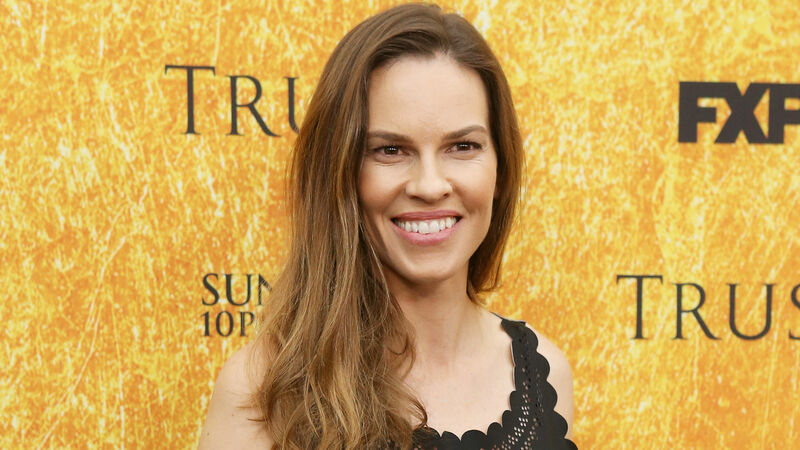 Celebrity weddings are always grand affairs, and, yes, that includes Hilary Swank's secret wedding to Philip Schneider. On Tuesday, not only did Vogue reveal Swank's marriage, but the magazine also shared stunning photos from her special day. Based on the photo gallery, they clearly couldn't be any happier. Over the weekend, they said I do at the Saint Lucia Preserve in Carmel, California. Swank and Schneider both love nature, so it made for the perfect location. "It’s a stunning private community surrounded by 20,000 acres of conservancy and an intimate redwood grove populated with trees that are over 800 years old," Swank told Vogue. If you had no idea Swank was even with someone, you're not the only one. As soon as they started seeing each other, it seems like they kept their relationship as private as possible. Supernatural star Misha Collins' wife, Victoria Vantoch, even helped set up the two. "It was a blind date set up by actor Misha Collins’s wife Vicki and another close friend Jean," Swank told Vogue. "We met at 10:00 a.m. and parted ways at 11:00 p.m. We clearly enjoyed our time!" It only took a year and a half for them to get engaged. "We don’t know why waited that long!” Swank said. Schneider popped the question in Colorado in 2016. "We stumbled upon a beautiful sanctuary deep in the mountains," Swank dished. "It had a stunning waterfall that cascades down to rustic cabins built in the 1800s surrounded by beautiful pines and big skies. One evening, Philip dropped to his knee in front of the waterfall and proposed — he sweetly made sure my dogs were nearby so they could bear witness!" And now they are married. This next wedding detail will please Law & Order: SVU fans. First of all, did you know Swank and Mariska Hargitay are best friends? Well, they are, and Hargitay served as Swank's maid of honor. Hargitay's daughter, Amaya, who is Swank's goddaughter, was also the flower girl. Schneider's best man was his father. As for Schneider's best friend, Collins, during the ceremony, he read a poem he wrote specifically for the newlyweds. Oh, and just wait until you hear about what Swank and Schneider did during the reception. They performed a "Fred Astaire and Ginger Rogers-style tap dance choreographed to Moby’s 'In My Heart.'" They even changed into costumes for what sounds like an amazing dance routine, which they did while wearing tap shoes designed by Christian Louboutin. They had such blast at the wedding that they even had an unplanned after-party. They all danced to wireless headphones and then, when the evening officially ended, according to Swank, they all rode on "bicycles decorated Burning Man-style with LED lights and streamers by our friend’s children," adding, "It was the perfect custom creation to punctuate a perfect custom evening." The wedding was definitely everything Swank could've hoped for. "It was timeless," she gushed. "There is just no other way to describe it. I was overwhelmed with such gratitude and thanks to be marrying the man of my dreams and to see all the people we love together in the middle of such a profound setting. It was truly a dream come true."